My noise projects: Tube Tentacles , DAIBEN , Blind Pornographics , Triệu Thị Trinh . I am very pleased to present my last job with nothing more and nothing less than one of the greatest artists of Japan noise, Yasutoshi Yoshida"Government Alpha". In a deluxe edition cardboard, with illustrations by Paolo Ppunto Massagli and two inserts specially designed for the occasion by Yasutoshi. 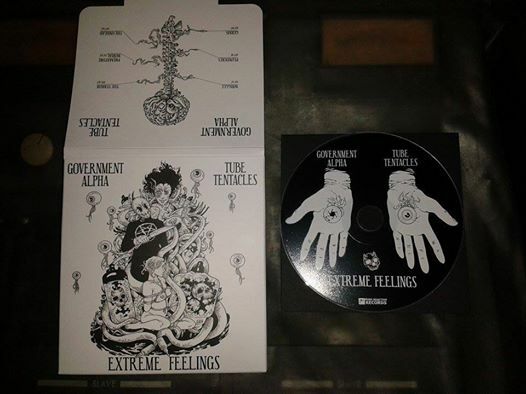 We find three tracks of Government Alpha, pure and dynamic Japan noise, high sound quality. 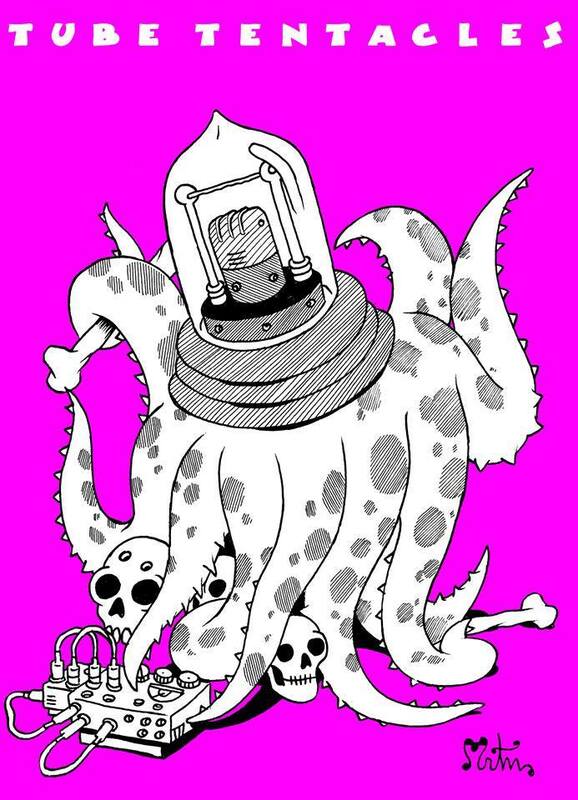 And three tracks of Tube Tentacles, where you can find industrial passages, noise, madness and much darkness. Thanks for help me with this edition David Area, María Durán Montes and rnxto art. The price is 10 Euros / 1300 Yens / 11 USD plus shipping. 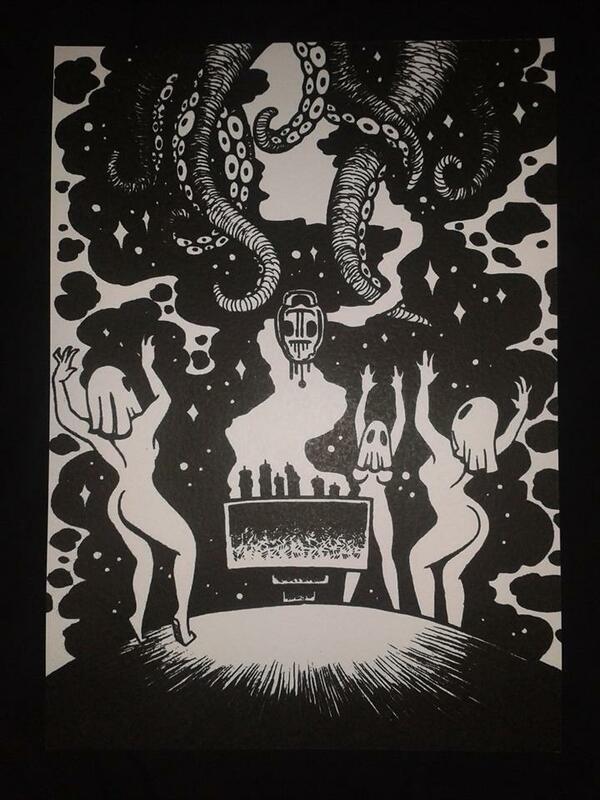 Illustration of Miguel Angel Martin for Tube Tentacles. 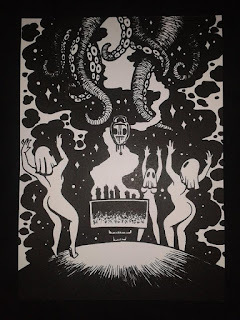 The saying Galician "Meigas, habelas hainas" and if it is to call them and gather them all in perfect communion, nothing better to address the so-called two alchemists haunted sound like Tube Tentacles (aka Daiben, Madrid) and Witches of Malibu (Richard Skott Rusch member Hunting Lodge, California). Both projects have a dual Mini-Split Cdr accompanied by a cover design of Elisa R. Aráuz and final artwork of Etbaal Abel Pajares Pardo, that leaves the bitumen submitting more than one film series B, Z or any letter you want. But in the case at hand, the film is a reduced soundtrack. 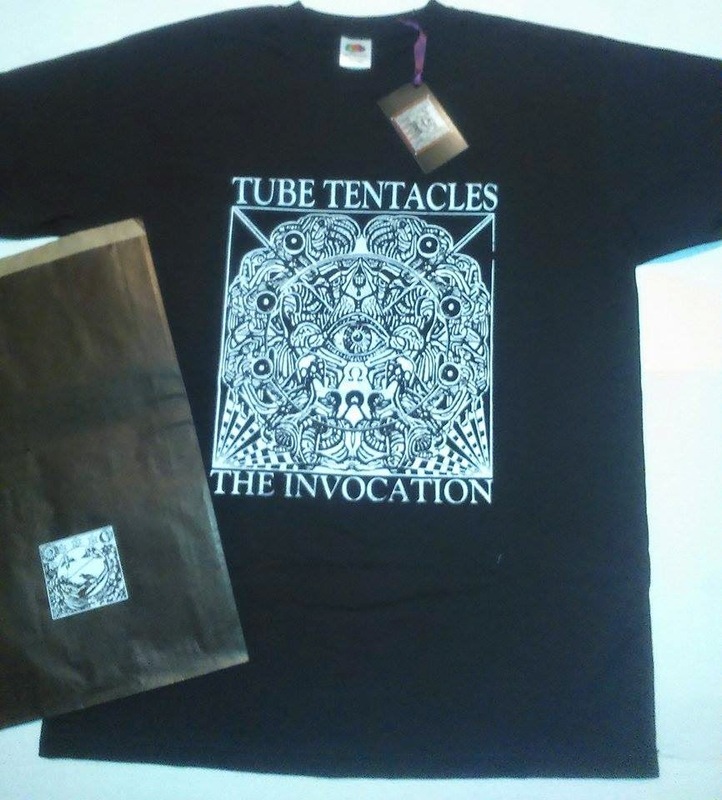 The first part, by Tube Tentacles, throws a great ritual-mystical aura from the first seconds. Ancestral, traditional and perennial, almost shamanic. Armed with his arsenal typical of Trogotronics and other analog synthesizers, the resulting atmosphere envelops the senses in a coven of vapors, winds, fog and lightning. When hearing this it can provoke a haunting trance. Dancing witches. The second part, directed by Witches Of Malibu, could very well be the awakening of the previous trance. Back from the subtle to the material. Post-stress relaxation and awaken in objective reality. Orchestrations for accepting reality as it is. Deltha waves giving way to the Alpha between familiar sounds but do not manage to identify their origin, as organic as cold as sharp as mysterious. Rest of the shaman. Pure symbolism that is topped with two cards and two separate drawings ofGraham Laur, strange animals that could belong to mythological stories of other world. -Limited edition of 50 units and only 30 hand screen printed posters. .Cd 8$ more shipping cost. .Cd more poster (size 29 cm x 40 cm, 190 grs.) 16$ more shipping cost. 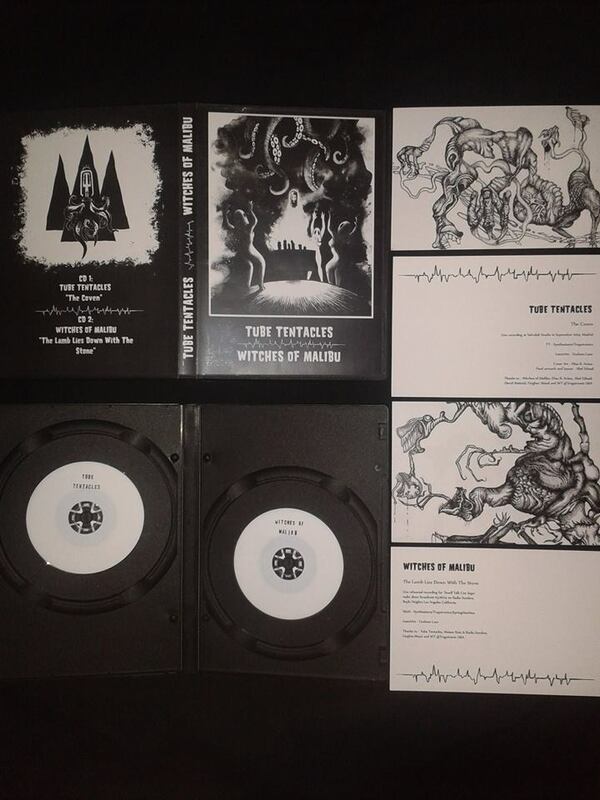 Tube Tentacles (tambien conocido como Daiben o como una de las mitades de Blind Pornographics) y Guilty C (no es necesaria presentación) unen sus particulares visiones del ruido en este split de manufactura exquisita tanto en el interior como en el exterior. Internamente, Tube Tentacles aporta 3 temas de ruido con pinceladas cósmicas y gotas de industrialismo desgarrado, mostrando la amplica gama de colores que tiñen su particular estilo. Por su parte el nipón Guilty C. hace lo propio con dos temas muy diferentes entre sí entregando especialmente en el segundo de ellos una buena dosis de Japanoise de alta gama. Externamente, el trabajo se presenta en un exclusivo Arigato Pack impreso con tinta de color plata y con un insert diseño a modo de collage por Guilty C. para la ocasión. 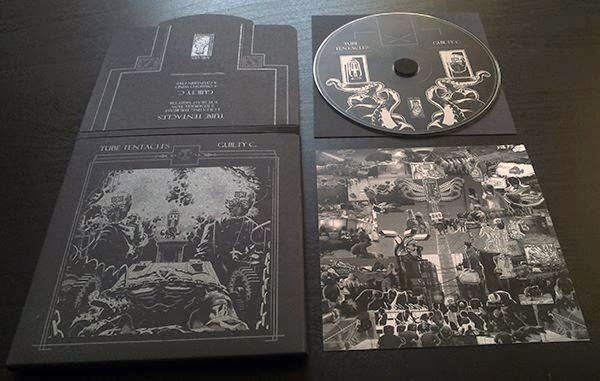 Tube Tentacles (aka Daiben or one half of Blind Pornographics) and Guilty C. (not necessary presentation) bind their particular visions of noise in this, inside and outside, exquisite manufactured split. 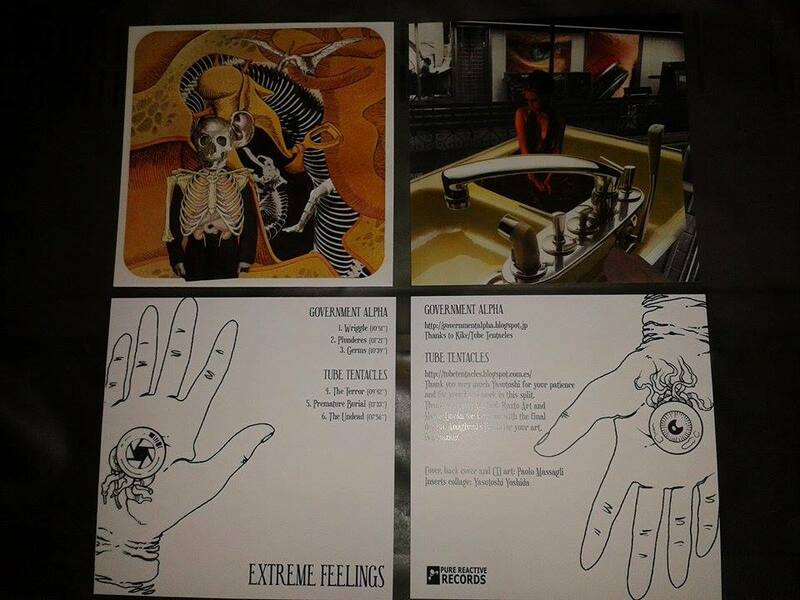 Internally, Tube Tentacles brings 3 songs with cosmic noise strokes and drops of industrialism, showing the range of colors of their particular style. Meanwhile the japanese Guilty C. does the same with two very different tracks, giving especially in the second a good dose of Japanoise high end. Externally, the work is presented in a unique Arigato Pack printed with silver ink and insert design with a collage by Guilty C. for the occasion. -"The Invocation" es el primer larga duración de Tube Tentacles, tras años de experimentación y progresión en el uso de sistemas analógicos. Previamente ha aparecido en recopilatorios como el de la conocida marca de sintetizadores experimentales, Trogotronic. "The Invocation" hace gala a su nombre adentrándose en la invocación de seres de ultratumba y espíritus cosmológicos mediante prácticas mágicas y esotéricas de larga tradición. Todo ello traducido en un lenguaje sonoro de gran intensidad ritual, oscura melancolia, y paisajes de gran inquietud y trascendencia. La longitud de los temas y su desarrollo, no hacen más que adentrar al oyente en este mundo paranormal y pseudo-místico con mayor profundidad y fuerza. El impecable diseño y exquisita presentación, culminan la genialidad de este trabajo gestado entre el 2012 y este moribundo 2014. 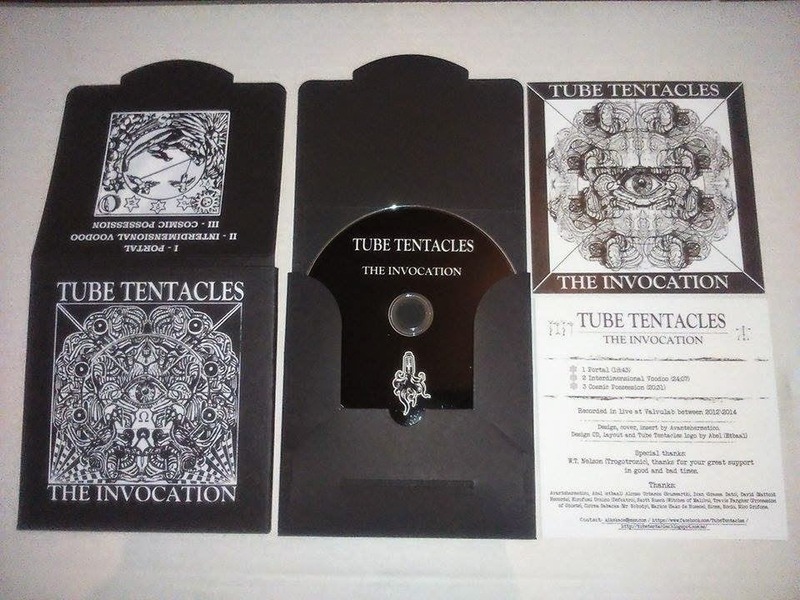 -"The Invocation" is the first full-length Tube Tentacles, after years of experimentation and progression in the use of analog systems. He has previously appeared on compilations like the name brand of experimental synths, Trogotronic. "The Invocation" boasts his name deeper into the invocation of otherworldly beings and cosmological spirits with magical and esoteric practices of long tradition. This translated into a language of great ritual sound intensity, dark melancholy, and landscapes of great concern and importance. The length of the themes and their development, are merely the listener delve into the paranormal and pseudo-mystical greater depth and strength world. The sleek design and exquisite presentation, culminating genius of this work gestated between 2012 and this dying 2014. "LIMITED EDITION OF 55 COPIES"
Only Shirt, contact with Avante Hermetico for price. -Pedidos con cd y camiseta, no se envían hasta después de diciembre. Hacer primero la reserva, sin previo pago y darme vuestras tallas. Una vez yo tenga las camisetas hechas, yo envio un mail de confirmacion, para que realiceis el pago. -Orders with cd and shirt, not sent until after December. Make first reservation without payment and give me your size. Once I have the shirts made, I send an email confirmation to you to realize the payment. -Mattoid Records, new release: Daiben / Catatonic State -"5 Formas Escatoligicas y Necrofilas de Amar"
-Format: Mini-Cdr (con llavero / with keychain). -Nuevo asalto de DAIBEN. Esta vez en el compilation We all are sons of Japanoise - Nahásh Atrym Productions. -New assault of DAIBEN. This time on We all are sons of Japanoise - Nahásh Atrym Productions.